Conception and pregnancy are complicated; many systems must work perfectly or problems with the fetus can occur. Problems that occur at conception are usually caused by chromosomal errors or abnormalities and can’t be avoided. Fetal malformations that occur during the pregnancy itself are commonly caused by issues in early pregnancy, while major organ systems are forming, and can be caused by maternal factors or factors within the womb. Chromosomal abnormalities are common in pregnancy. Abnormal genes are neither avoidable or fixable. Some typical genetic abnormalities include trisomies, where three copies of a specific gene are present rather than the normal two; common trisomies include trisomy 21, also known as Down syndrome, trisomy 18 and trisomy 13. Down syndrome is the most common trisomy, occurring in one in 800 to 1,000 births, the University of Virginia Health System states, and also the most survivable. Many genetic malformations are incompatible with life. Other types of genetic malformations may be inherited, or may occur as spontaneous mutations. Some genetic diseases are caused by a missing part of a chromosome, such as Cri du Chat, a syndrome that include a small head, severe retardation and many developmental delays. Inherited genetic defects such as Marfan syndrome, characterized by abnormal connective tissue throughout the body can be passed to a child by one or both parents. Some factors that interfere with the development of a genetically normal fetus are related to maternal behaviors and diseases. Fetal alcohol syndrome is probably the best example of maternal behavior causing fetal malformations. Diabetes is associated with the potential for major fetal malformations, the Merck Manual states. Infections that occur in the first trimester can also cause fetal malformations; rubella, or German measles is a common example; chicken pox, toxoplasmosis and cytomegalovuris can also cause fetal problems. Drugs such as thalidomide taken early in pregnancy can also cause major fetal malformations; anti-seizure medications are also associated with congenital malformations, Merck reports. Low levels of folic acid have been implicated in causing neural tube defects, where the spinal cord isn’t completely enclosed. Amniotic fluid surrounds and protects the fetus. Several amniotic abnormalities can cause fetal malformations. Oligohydramnios is a low level of amniotic fluid. 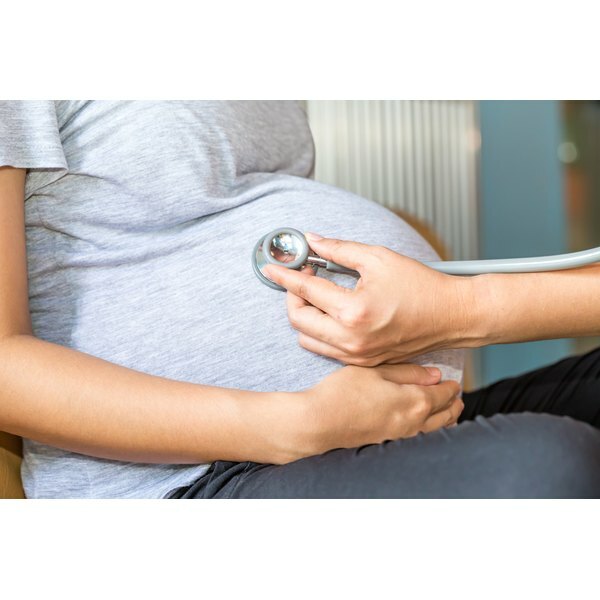 If fluid levels are low in the first part of pregnancy, the fetus may be compressed against the walls of the uterus and malformations of growing body parts can occur. Amniotic bands can also cause fetal malformations. Amniotic bands occur when pieces of the amniotic sac separate and float in the amniotic fluid. Much like a hair can get wrapped around a digit, amniotic strands can wrap around extremities and cut off circulation. Part of a limb or digit can be amputated by the band, or the band may leave a constriction in the area. Severe amniotic bands may be removed during fetal surgery, the University of California, San Francisco reports.